One problem with the Iron Man movie was that people loved the movie and when they wanted more of that and turned to the comics, the character was not exactly the same. This can mean some quick course corrections by the publisher to catch up to the movies. Remember after X-Men came out, all the costumes in the comic book were changed to follow the tone set by the movie. Same with Batman. But when Avengers hit the silver screen, Marvel had time to put the pieces into place. Already, they knew that Iron Man, Captain America, Thor, Hulk, Hawkeye, and Black Widow were going to be part of that movie, which was going to make truck loads of money. If Marvel wanted some of those truckloads of money, they needed some books that would reflect the movie. Enter Avengers Assemble. I found this book as a collected edition, unaware of its existence when it was coming out in monthly issues. It caught my eye because the cover included not just Avengers, but the Guardians of the Galaxy! There was Hulk, Cap, and Thor side by side with Rocky Racoon, Bug, and Drax the Destroyer. (There was an unusual amount of green on that cover.) In fact, reading the back, I figured this was a one-off mini-series. Judging from the roster of Avengers, I figured it was a mini-series that they were putting out, teaming up the movie Avengers roster with the Guardians of the Galaxy, hitting two birds with one stone: a series featuring the Avengers we know and love from the silver screen that also introduces the next big team, the Guardians of the Galaxy, becoming a graphic novel that can be available when the Guardians hit the silver screen later. I was surprised to find that I was only partially right. 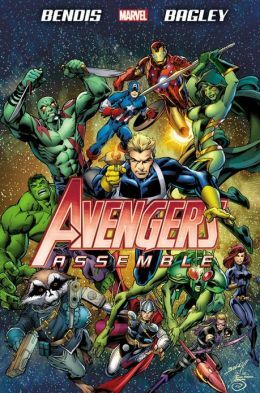 This book collects the first eight issues of an ongoing series featuring the movie roster, written by Brian Michael Bendis with art by Mark Bagley. But the question became the same question I ask every time I pick up a book that ties into current continuity. Will someone who is not following the Marvel universe closely be able to follow what is going on? Is this for fans of the movie who like comics? Or for fans of the comic who like the movies? Captain America (handing Tony Stark a piece of cloth): Hulk had a run-in with a man wearing this. Black Widow: You know your Zodiac, Tony. Tony Stark: I know everything. I can't help it. I can't help hearing his voice in my head when I read any Iron Man comic. And, as can be expected considering this is a team up with Guardians of the Galaxy, the action takes us into space for some big space brawls. This is a cosmic story that even has some thought provoking moments. Of course the question is, does it do the job? Is the story accessible to people who know the Avengers from the movies? Or to people who know the Avengers, but are not up to speed with the current continuity? Yes, it does. The only confusing thing might be when Spider-Man and Wolverine show up in a couple small scenes as members of the Avengers. Oh, and when Hawkeye and Black Widow shared an intimate moment it felt natural to me, based on what I had seen in the Avengers movie — but it wasn't supposed to feel natural, I guess, because apparently Hawkeye has a girlfriend. Mockingbird? I don't know — I'm not up to speed with the current Avengers storyline. Does the story introduce Guardians of the Galaxy to people who have no idea who they are? Mostly. I have a passing familiarity with the current Guaardians of the Galaxy, but I felt like the introduction of the characters and the ideas (including Thanos) was well done. Like I said, this felt like a movie. If this WAS Avengers 2, I'd be happy. I give this the highest praise I can give to a graphic novel: I would read it again. UPDATE: I first read this book before the Iron Man 3 home release, with the Agent Carter Marvel One Shot, and that release has an added another dimension of a connection to the MCU: the Zodiac. In Agent Carter it's a formula, not a team, so this is probably coincidence. But it's an interesting coincidence. Is Agent Hill’s personality coming out in this volume, or is she still hiding in the background? Agent Hill just barks orders in a couple scenes.